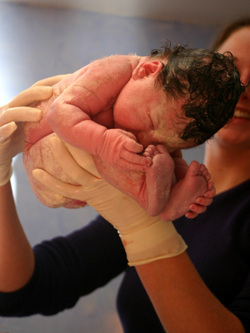 Homebirth: a growing trend for low-risk moms and babies. Safe, meaningful, and empowering births happen at home! Did you know that the number of U.S. families who chose home as the place of birth increased 20% between 2004 and 2008? WOW! If you and your baby are healthy, expecting a normal birth, and hoping for a natural birth, homebirth is a wonderful choice. The Home Sweet Home class is primarily for couples planning on birthing at home; however, those who are in the "curious" or "unsure" categories will find plenty of information and resources to help you decide if homebirth is the right choice for you, your baby, and your family. Instructor: Christelle J. K. Hagen, BfNC, HCHD. Christelle is an experienced childbirth educator (Apple Tree Family Ministries/Childbirth without Fear method). Christelle has given birth four times at home and treasures her homebirth stories! Learn more about Christelle.